"I haven’t been to a Mexican restaurant in a very long time. This place was more than I expected. The food was awesome, the staff was very nice and friendly, service was quick and the price was very reasonable. I will definitely be back . . . Soon!!!!" "This is one of the best Mexican restaurants I have encountered to date. A little small but a great atmosphere.laurie was my server and she was absolutely amazing. I can not wait to try more dishes from here." "Love this place!!!!. Aguacates is the best Mexican food we have eaten in a very long time. It is very authentic and delicious. The complimentary chips and salsa is fantastic! The meals are nice portions and very reasonably priced. The restaurant is small but it is very clean and the staff is friendly. There is also a nice little patio for outside summer dining. We have eaten here twice now and we will likely return several more times." "Love the new menu! Great food as always!! We love your salsa and chips. Quick service.could use some updates inthe women's restoom"
"This a a very good Mexican restaurant. The food is of great quality and authentic. The servers are nice but could be a little more attentive." "With so many possible choices to pick In the Doral area for lunch, the possibilities are endless but I had the sudden urge for Mexican and this place surely did not disappoint. I got there and was greeted kindly by the server, asking me what I wanted, I chose the quesadillas. As I was waiting to take my food to go, I noticed they have the option of pick up, just call and order and food will be ready when you arrive. Once I got my food I left and went back to work to eat my savory quesadillas with sour cream, guacamole (extra charge) and pico de gallo, yumm....Surely I was in heaven for those 10 minutes left I had of my break but sadly was cut short, I ate half of my quesadillas, slices were big and fulfilling..Will I go again? of course, their Mexican food looks and taste authentic but this time i'll order on the phone to spend more time in the break room enjoying my order. :-)"
"100% recommend eating at Aguacates!!! It is so delicious & authentic it's FANTABULOSO! I highly recommend everyone to eat here. The people there are so kind and friendly. Just loved it! Yum, YUM, YUMMY!" "Always a good experience eating here and it's slowly getting better. Had dinner there last Saturday night. Wife ordered a margarita and was given a complimentary shot of tequila by who we assumed is the owner. We noticed him going to other tables and doing the same. Anyways, the food is always good and served quickly. Staff are always friendly and help each other out. Had one waitress who served us, but another one got our daughter a refill and took our bill for us. Luckily we live in the area so we can go back whenever." "There are four choices for "Mexican food" in Lockport. This one blows the other three out of the water. The food is always awesome — even if I'm not always sure what I'm ordering. And it comes super quick. Oh! And free chips and salsa. Yep. Go here." "This is a very good authentic Mexican Restaurant. There selection is a wide range of Mexican food. The food is prepared quickly and the service is fast and efficient." 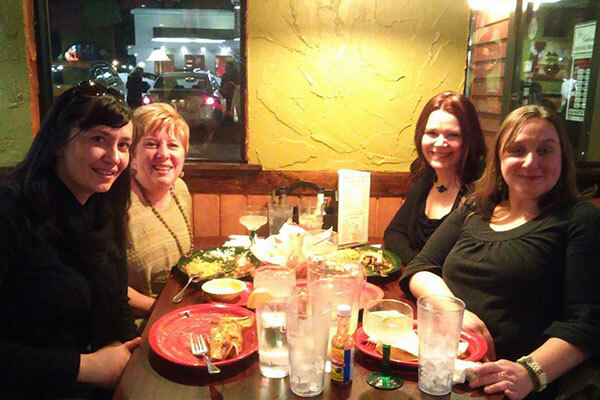 "We went for Cinco De Mayo, everyone was very nice and the food was wonderful!! I would definitely go again!!" "5 stars isn't enough! Food so good, makes me dance when I eat it! Lol"
"The menu selection was vast. The food and service was great. It's the best Mexican food around." "The nicest staff you could ask for, totally cute interior, and the best part of all AMAZING food at a great price!!!! My family & I frequent this establishment often and cannot get enough." "Get the guacamole. It's fresh and free chips are light and tasty. They provide pico de gallo along with salsa!" " Great food, great pieces, and staff is very attentive." "Don't usually expect much from Mexican restaurants in WNY, the food was good and they gave you plenty of it, I'd eat there again if I was in the area." "Congratulations to the owners on their 1st anniversary in Lockport! Enjoyable and Family friendly. Food is delicious. Add hot sauce slowly. My husband would like to buy a few bottles of it. Unending chips and fresh salsa. Yummy! Generous portions. I love the Chicken Monterey. Staff is very attentive. A favorite place to go." "Best Mexican restaurant I have ever eaten at! Food is awesome, Staff is great menu selection very large and best of all the prices are very reasonable! The only very small downside is restaurant size is small; needs seating for thirty to forty more guest!" "Everything is so good there!" "The food was fast,staff was nice, prices reasonable and tasted great"
"I took a close friend here for dinner and a ladies night out. As before, I was not disappointed! The service was friendly, the food was amazing and we closed the place down at the end of the night. The servers didn't even blink about us staying for a chat. The were also as accommodating as possible in trying to..."
"Food was delicious. Great, friendly staff." "Went here for our first time last night and it won't be our last. Clean and comfortable dinning area. The food was very good with a large variety to choose from. The staff were all very friendly and attentive. They seemed to actually like working there. Many of them singing and dancing to the Latino music on the radio. Our waitress, Daily was a very nice young woman who seemed to know what we were going to order before we could get it out of our mouths. The prices were fair for what we got and we didn't leave hungry for sure. The wife had a margarita and it actually cost less than desert, $4.25. We are looking forward to going again when we are in Lockport around dinner time." "Some of the best Mexican food I've ever eaten! I lived in Tucson AZ for a while and had lots of Mexican food and these guys at Aguacates are the real deal. If you want real authentic Mexican food, then this is the place for you. When you walk in it's like you stepped into Mexico with the decor, the music and the staff. Their service and attention to detail are outstanding! We were there last night and the place was packed on a Thursday! We love it and it's definitely become one of our Favs!" "My grandson took me there for lunch on Thursday (my first time there). I had to bring my husband back on Friday because the food was so good! Both times I had the vegetarian option C (I am not a vegetarian, my grandson is though). Delicious! The staff is very friendly too!" "It was a pleasant experience, Texas Fajitas were right on! Service was fast, servers were polite and friendly. You should try it." "Good food and service! Will definitely be going back!" "This family owned restaurant makes the best variety of Mexican food in Niagara county with reasonable prices and a very attentive serving staff"
"I was impressed with this place! It's a small whole in the wall, but that's usually the best kind of food. The service was kind and attentive. The portions are great and the price is spot on. I got a taco salad with the works. Lettuce, rice, beans, spicy chicken, sour cream, guacamole, cheese. Very good! You can tell the outer shells for the bowl are homemade. They have several different types of meats for you to choose from for any of the dishes they serve. That includes: grilled chicken, spicy chicken, pork, steak, ground beef, etc. They have a decent salsa bar as well. You can serve yourself all of the salsas you may need and different temperatures depending on your liking for spicy. I will definitely be back here in the near future. Great lunch spot if you're in the Doral area and looking for a quick bite of Mexican (and you want to avoid chains like 'Lime')." "This was such amazing food! Small restaurant but well worth the trip. Food was delicious and very authentic. I really loved the taste of the refried beans. They really were homemade! You don't often get that. One of my dining partners usually has difficulty eating Mexican. He tried this place and was so pleasantly surprised! So, we will return next vacation weekend!" "I've only been here once but I was very impressed. The atmosphere is quaint, although the place feels a bit small. The menu is probably the most extensive Mexican menu I've ever seen. It's almost overwhelming in fact. The service was good. I've heard that when they get busy, their service can slow down somewhat. Our server was definitely Hispanic and had some trouble with English, but it was barely noticeable. Honestly, it even added to the atmosphere. The food was surprisingly good. I wasn't even in the mood for Mexican that day, but a few bites changed that in no time. I can't wait to come here again and try out something different."